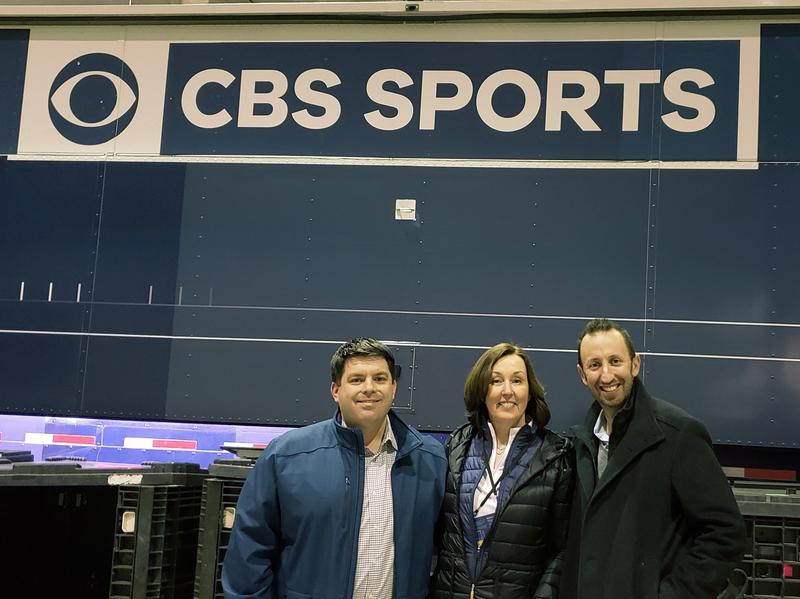 The countdown to Super Bowl LIII is under way, and, for the production team at CBS Sports, it is the culmination of years of work, site visits, and planning. As usual, it’s a massive effort and will provide plenty of innovation, including a show open that no one will want to miss. Patty Power, EVP, operations and engineering, CBS Sports, says the entire production and related efforts over the past couple of years have been a fantastic team effort. Mike Francis, VP, remote engineering and planning, and Jason Cohen, VP, remote technical operations, are playing key roles in Super Bowl planning. Power says Francis brings the engineering expertise and Cohen, who joined CBS less than a year ago, brought trying different things to a new level. “I think we make a great team,” she says. 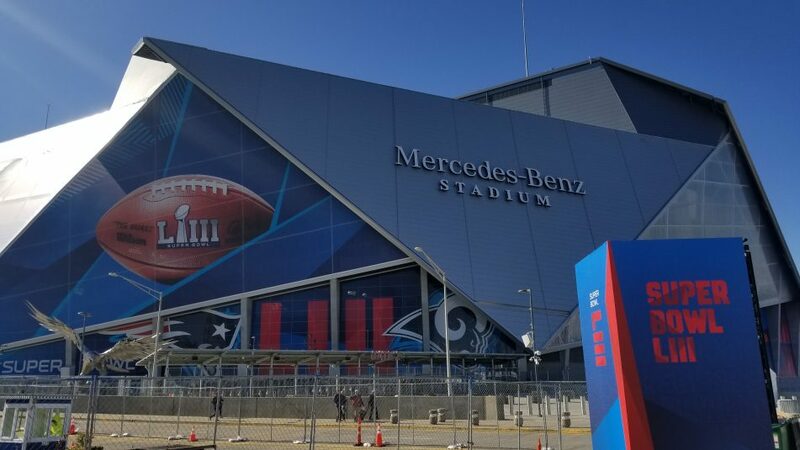 Mercedes-Benz Stadium is home to Super Bowl LIII on CBS this Sunday. The efforts, as usual for a Super Bowl, are impressive. The CBS presence in the compound comprises 14 mobile trucks and 12 office trailers. There are 115 cameras being shared among 332 channels of record and playback, and 2,000 channels of local intercom (and 50 channels trunked to New York) ensure that production and technical operations go smoothly. CP Communications is handling all frequency coordination as well as wireless comms, wireless IFB mics, supplemental audio gear, and all audio efforts on the field and all five sets. Francis says that having access to dark fiber to the sets has given the team control with respect to sharing resources wherever they are needed. There are also 29 transmission and receive paths, five uplinks, and 10 Gbps of data circuits for file transfers as CBS leverages the team back home. ThumbWar provides the six edit systems, and they are located in NEP’s CBS D unit, which is the edit truck CBS relies on for golf and postseason football, and two Game Creek Video edit trucks. This year’s efforts actually include an impressive technical undertaking for the opening of the show. For the first time ever, augmented reality will be deployed in a multicamera environment, bringing AR graphics to four camera angles that, combined, will deliver a new and exciting look to the big game and also lay the groundwork for similar innovations. 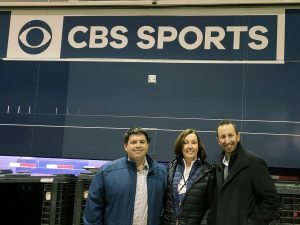 From left: CBS Sports’ Mike Francis, Patty Power, and Jason Cohen have led the operations and technical efforts for Super Bowl LIII. The Future Group-built animatic for the open is loaded onto an EVS and features an audio track with sound effects and music, as well as an audio cue that uses timecode to trigger four AR servers running The Future Group’s Pixotope software, and the four AR servers in sync with the audio cue begin their playout of the graphics effects, which is simply four cameras being played through them. The AR innovations extend beyond the show open. The main set on the concourse level also has two AR cameras that will bring a new look to coverage, and SMT will once again play a key role in AR efforts. SMT will supply its Sportcg scorebug, virtual first and 10 line, virtual CameraTracker on the two SkyCams, live, realtime stats via QBStat, telestration technology and virtual goal post extensions. SMT’s Camera Tracker system was also instrumental in collecting the field geometry data that Future Group used to render the graphics for the spectacular show open. The multicamera application of AR at the top of the show, however, is what Cohen thinks will have a lasting impact. CBS will deploy 115 cameras, including 10 4K Sony HDC-4800 cameras with high-speed recording and zoom. And, in a true innovation, three Panasonic AK-SHB800 8K cameras will be deployed around the field, with one above each end zone in the cat walk and then one at the all-22 position. The three Panasonic cameras will play out via Evertz DreamCatcher replay systems; the Sony 4K systems will rely on Sony PSW-4500 replay servers. The Panasonic 8K cameras connect to an AK-SHU800 camera-control unit via two single-mode fiber lines like a regular studio camera, but the CCU outputs the 8K signal as four 12-Gbps 4K signals. Each of those four signals is converted to four 3-Gbps signals and passed to the DreamCatcher via 16 3-Gbps inputs. 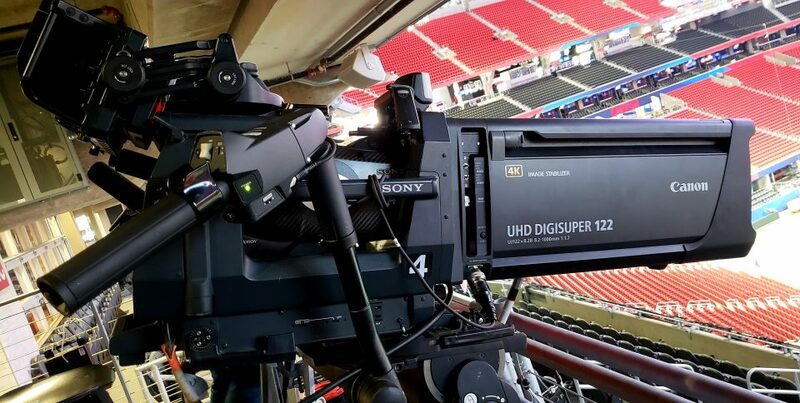 One of the plays in the AFC Championship game, a punt that appeared to have hit New England Patriot wide receiver Julian Edelman, exemplifies the benefits of having 8K cameras as part of the arsenal. The team is also mounting three Pico cameras on the goalpost to help capture shots of the line at the back of each end zone. Another barrier that CBS will break is the use of three SkyCams in a stadium. Also helping with the coverage will be an 8K C360 Live camera mounted on a catwalk at the top of the stadium. Located above the Halo videoboard, it opens up the possibility for dramatic shots that seem to have been captured from a blimp rather than a small, 4-lb. camera. Moves can be programmed for the C360, giving it the ability to zoom into the stadium and add yet another angle to coverage of things like player introductions. The production team is also using some of the newer lenses on the market, including Canon’s new 122X lens and four 111X lenses. Fujinon 107X lenses will also be used. Canon’s 122X lens will be on the reverse 50-yard line for Super Bowl LIII. Even the booth is getting a bit of technical innovation with a JitaCam mounted on a robotic rail, which will give some movement to shots of the announcers and even of the field. The final imaging innovation will be a tethered drone from Measure, which will be located a little more than half a mile from the stadium. It will use a LiveU transmitter and a cable modem to send exterior shots of the stadium with the Atlanta skyline in the background. Because it is tethered, it will be powered continuously and will be able to get a shot that otherwise wasn’t possible. With all the cameras, Francis is confident that the team is ready to supply all the correct angles. Power says the CBS team spent weeks on disaster recovery, developing clear plans that were available to everyone on the production and technical teams for a large variety of disaster scenarios and the appropriate steps. And when it comes to redundant power, CBS is again taking things up a notch. For Super Bowl 50, the network worked with Filmwerks International to develop a new type of UPS generator that protected the game truck. The key to Super Bowl coverage and innovation, he adds, is to bring technology that enhances the storytelling. Power notes that, at the end of the day it is still a football game: “You don’t want to be too distracting” with innovations. NEP’s SSCBS A, B, C, and D units are at the center of the effort. The A unit will house game production, game graphics, and goalpost–robo-camera operation. The B unit will have game audio and IPG distribution headend; the C unit will house the majority of EVS game replay operators, ChyronHego operations, and SMT first-down-line operations. The D unit, meanwhile, will handle tease edits. Game Creek Video’s Encore A unit will be on hand for additional game video, pre/postgame audio and video, and 8K operations; the B unit will handle pre/postproduction, graphics, and C360 operations. The C unit will be home to pre/post EVS, the Sony server operators who are working with the Fletcher-provided HDC-4800 4K cameras, and 8K operators. F&F Productions’ GTX17 will handle tape-release production, backup production, additional game EVS, and additional game video, and GTX18B will be home to comms, Pico replay operators, a second pylon operator, augmented-reality operations, and EA Sports. Game Creek Edit 3, 4, and B-5 will also play key roles. Edit 3 will do ingests, game and pre/post editing, color tease, game After Effects operations, and MAM. Edit 4 will house pre/post After Effects, pre/post Duets, and graphics management. And B-5 will be home to pan-bar robotic operations and all other Fletcher robos except for those on the goalposts, which are handled in NEP SSCBS A.
NEP’s TX/ESU trailer will be onsite for router distribution, transmission control, and distribution to the world feed, Mercedes-Benz Stadium, halftime show, and all other outside vendors. And the AVS RF truck will be on hand to manage all RF cameras for game and pre/post as well as camera-feed distribution to SSCBS B, Encore A, and video-paint control in those trucks.